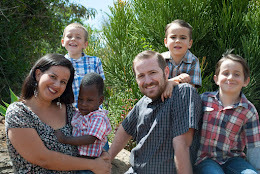 A little over two years ago we moved our family of four into an exciting adventure in Nairobi, Kenya. Excited to start a new life as "missionaries" we began an intensive language coarse to learn Kiswahili. We knew little about how anything would pan out. Did we have enough money to make it to next month? How would we get a car? We coasted on trusting in the one and only thing we knew, God called us and he would be with us. Everything was exciting because we were taking God at His word. About a month into our move, everything from within me cried out for my life in America. The comforts, the certainty, my friends, family, convenience. Although I've never seen this first hand, watching me was probably a bit like watching a drug addict give up their habit. I frequently called home in tears over hearing their voices, I craved to walk through malls sipping coffee, I craved my independence. One thing was for sure, I was sinking. I would be crippled somedays with thoughts of helplessness, fear, anxiety. Just a bit of peace was all I wanted. In my mind I knew peace came from our Lord but in my flesh I wanted just one more hit of America, a coffee shop, a bit of shopping, anything to get my mind off of my quiet, unfamiliar, uneventful, frustrating life. We began to wake up from awful nightmares and an alarming event where a frightening confrontation between our guard and a drunk really caused me to pray and read God's word faithfully. I understood for the first time what I had to change in my life to hold on to God without resentment or fear. I begged God to become our hope, our light, our familiar place. I wouldn't take back these two years in Kenya for anything. It was in this desert where I found the only well spring that became my refuge. And Jesus met me there. When I've spoke to wonderful families such as some missionary friends of ours. I've always wondered how they have this unshakeable trust in the Lord. It was because God has placed them in fires that they clung to the Lord. I am in a lot of ways like a new born baby, clinging to it's mother, waiting for the next feeding, tired, joyful one moment, in tears the next. These last two years have been precious for my personal growth in Christ and have been priceless as a family. We have grown together in Jesus and in his Word and have seen the work of His hands. The best part and worst part about being a missionary is we don't actually have any long-term plans. God holds it all. The work God has done in our lives has proved that He will never leave us or forsake us and He is absolutely faithful, even when I am faithless. We attended the missions conference this past week and were renewed, refreshed and reminded that this work in Kenya is His work, not ours. He gets all the glory and praise because He has done great things in us and in His church! We praise Him because He is letting us be involved in His precious church, He's working in us and He's not finished with us. We are so thankful to have spent this precious time with our family and friends. A special thank you for all your love and support during our visit. We will be flying home, Tuesday, Jan. 17th. We are excited to kick this year off, praising our Lord for the great things He has done in 2011 and we are excited to see the great things He has in store this year! Ephesians 2:19-22 Consequently, you are no longer foreigners and strangers, but fellow citizens with God’s people and also members of his household, built on the foundation of the apostles and prophets, with Christ Jesus himself as the chief cornerstone. In him the whole building is joined together and rises to become a holy temple in the Lord. And in him you too are being built together to become a dwelling in which God lives by his Spirit. Ephesians 2:8-10 For it is by grace you have been saved, through faith—and this is not from yourselves, it is the gift of God— not by works, so that no one can boast. For we are God’s handiwork, created in Christ Jesus to do good works, which God prepared in advance for us to do.